Not since ‘Mean Girls’ has a high school popularity contest made me this emotional. “Break boundaries! Make history! Rock that sash,” says transgender teenager Charlie Baum, who was crowned homecoming queen in Georgia after years of bullying. Not since the scene in Mean Girls when Lindsay Lohan breaks her crown into pieces has a high school dance made me this emotional. Baum, who lives near Atlanta, was crowned by Forsyth Central High School on Saturday. The teen says the recognition was “so validating” after experiencing years of “death threats and plenty of public humiliation” at the hands of her classmates. That changed when her friends nominated her for homecoming queen. Growing up in conservative Georgia was “scary” for Baum, who knew she was a girl as early as elementary school, but was aware her “very intense love for Hannah Montana and literally ANYTHING pink was frowned upon.” In high school, Baum first identified as gay and began experimenting with drag as a form of self expression, which incurred the ridicule of teenagers, who are notoriously awful. “This year, in particular, I spent the first semester not out as trans but instead going to school regularly with crazy dramatic makeup,” Baum explained. “This angered plenty of people, some to the point of harassment.” Baum was heavily bullied online, but turned to social media as an outlet, and came out as trans in an Instagram post in December. Baum has weathered the harassment with the help of her friends, who nominated her for homecoming queen. 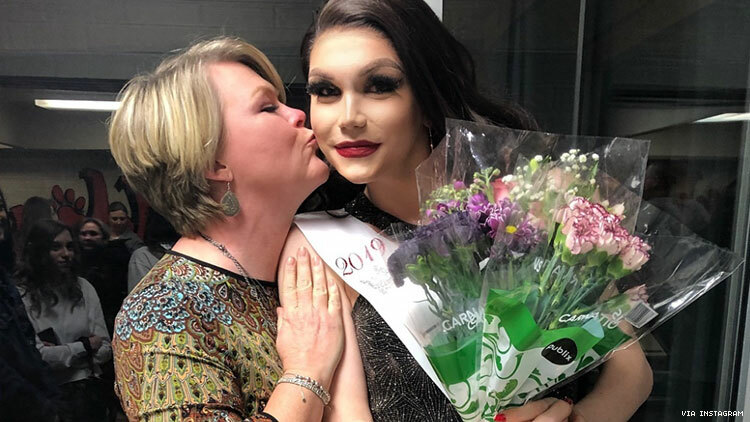 “They had seen me have a rough year with a lot of students and they were also aware that for a trans girl to be nominated and possibly win in this county is not just surprising but also historic.” Baum was “hell-bent” on winning, “not just ‘cause I like looking pretty, but also for the LGBT community.” We love a humble queen, long may she reign!